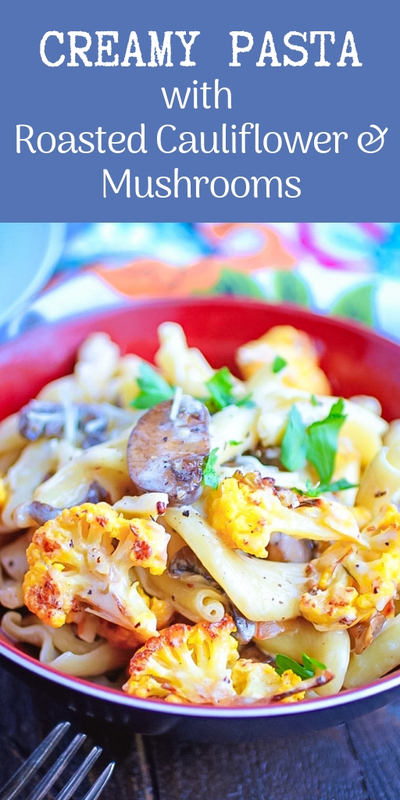 Creamy Pasta with Roasted Cauliflower and Mushrooms is a rich and hearty meal perfect for the season.Can we agree that there’s nothing better than roasted vegetables? Okay, so chocolate may have come into play here, but as far as veggies are concerned, roasted vegetables are amazing! A little indulgence this time of year is a given, am I right? If you prefer to indulge in dinner rather than dessert, then Creamy Pasta with Roasted Cauliflower and Mushrooms is the meal for you. Do you have visitors coming in the weeks ahead? Save this recipe and make it for your guests. You’ll impress them without a lot of effort, and they’ll go home raving about your cooking! I wish my photos for this recipe had captured a bit more of the creaminess of the dish. Sometimes pasta is sneaky like that – it soaks up that creamy goodness after sitting for a several minutes posing for pictures. But believe me, it’s in there. I roasted yellow cauliflower florets until they were golden and soft. It was all I could do to stop myself from sneaking bite after bite of them, leaving me with enough for the pasta! Thinking about it, purple cauliflower would have added a nice bit of color to this pasta. Maybe next time. Of course the mushrooms add an earthy flavor and hearty texture to the dish, and when they’re coated in a creamy sauce? Oh, my! 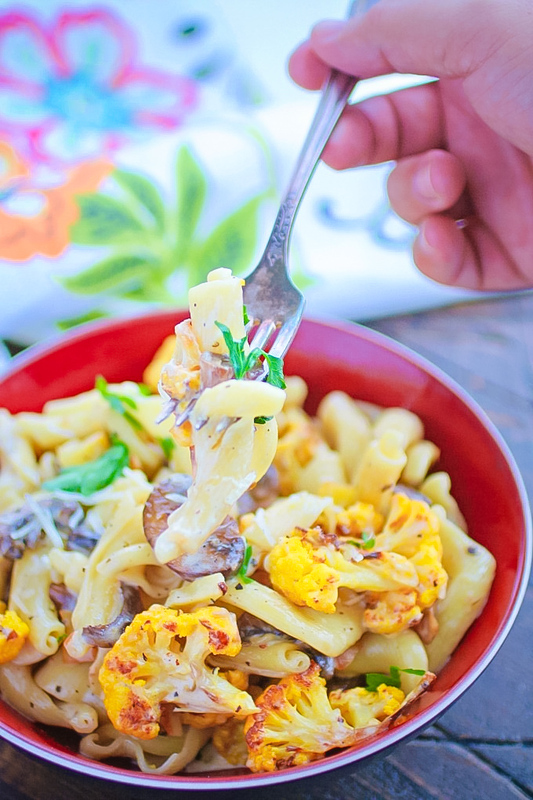 Creamy Pasta with Roasted Cauliflower and Mushrooms really couldn’t be easier to make, and you don’t have to save it for company. I made it on a random Thursday night, and enjoyed the leftovers, too! If you're looking for a little indulgence in your meal, try this dish! The roasted cauliflower is such a treat combined with the mushrooms and cream. Preheat the oven to 400 degrees F. Toss the cauliflower florets in 1 tablespoon of olive oil and season with salt and pepper. Place on a baking sheet in a single layer and roast in the oven for 30-40 minutes, or until golden and softened. Prepare the pasta according to the package directions. Drain and set aside. As the pasta is cooking, add the remaining oil and butter to a large skillet over medium heat. When hot, add the shallot and cook for a minute or so. Add the mushrooms and cook for just a few minutes. Add the vegetable stock, salt, pepper, and thyme. Cook for 3-4 minutes until the mushrooms have softened. Add the heavy cream to the skillet and stir to combine. Cook for a few minutes, then add the pasta, cauliflower, and Parmesan cheese to the skillet. Toss to combine and allow the ingredients to warm through. Serve warm and garnish with the fresh parsley. I've always enjoyed dishes with pasta, sausage and veggies. Yours looks especially delicious. There isn't anything in this dish I wouldn't enjoy. Love the combinations. Sounds like a winner for you, Candy! Hope you try it and enjoy! Omg! This looks so yummy. I so need to try it! Thanks, Briana! Hope you do! Yes! Roasted veggies are the best! And of course pasta and cheese are always winners, too. I agree that there really isn't much better than roasted veggies. It adds so much flavor and gets my kids to eat them. Loving the yellow cauliflower. This looks so creamy and delicious! The flavors in this must be amazing! Looks delicious. I adore roasted vegetables, Patricia, even more than chocolate! 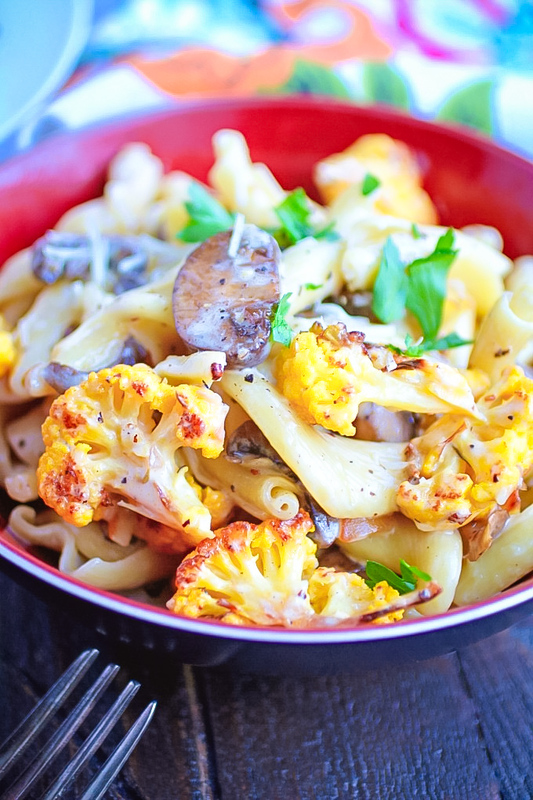 Your Creamy Pasta with Roasted Cauliflower looks absolutely delicious - the flavours sound amazing. Thanks so much, April! More than chocolate?! Haha! That's awesome! Oh man! I am SO making this tonight. 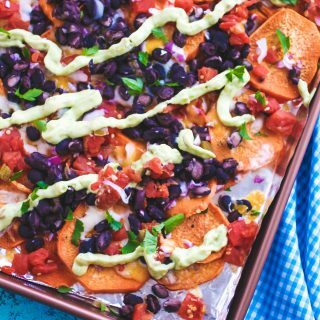 This looks delicious, and super easy to make. Do you have any recipes for Roasted tomato and red pepper soup or Butternut Squash soup? I'd love to try those out too. Thanks so much! I have recipes for both on the site! Am I the only one who has never had roasted veggies? Definitely giving this one a try soon! Oh! You have to try it! It's so easy to make roasted veggies, and the flavor is out of this world! I am a HUGE fan of pasta. I'd have to leave out the mushrooms though. I don't like them. But everything else looks amazing. Thanks, Amber! I'm sure this will be wonderful, even without the mushrooms ;) Consider adding something else you love! 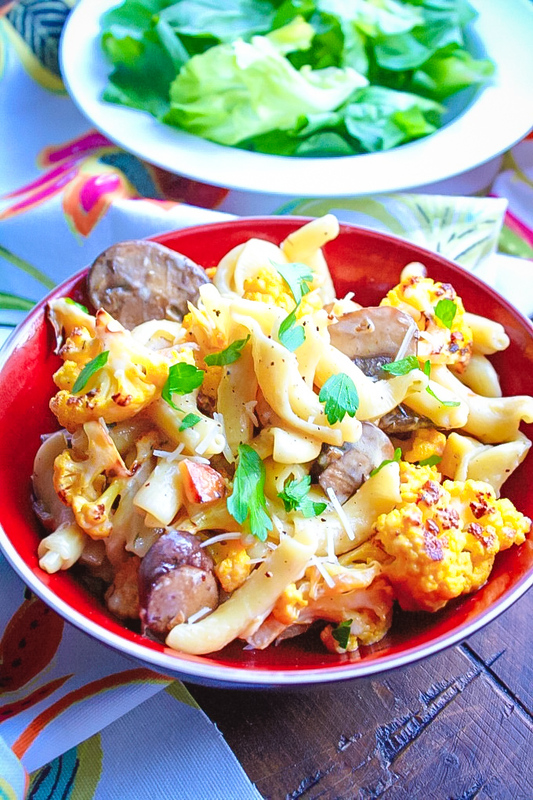 I love the golden cauliflower and mushrooms in this dish! So many of my favorite things, it looks so delicious! Thanks, Stacey! I love this dish -- and I LOVE roasted veggies! Oh yes! I'm a big fan of roasted veggies too! Can't wait to try this for dinner! Thanks, Nicole! I hope you'll love it as much as I do! You had me at creamy! This dish sounds like such yummy comfort food. I love roasted mushrooms and can't wait to try this recipe. Thanks so much! I hope you try it soon, and enjoy! This recipe looks amazing. I have to give it a try. Thanks, Tasheena - hope you do! All the ingredients I love! Great idea about making it for guests! I love the colorful cauliflower and your pictures are beautiful! Thank you so much, Sheila! I hope you give it a try and enjoy it! This creamy pasta looks absolutely delicious that I am even willing to forgive the cauliflower lol. Haha! Well.....you could try roasting broccoli instead! That would be nice in this dish, too! Thanks, Anosa! This pasta looks so colorful, healthy and delicious! Thanks for sharing the recipe with us! Thanks, Kusum! I hope you try it -- sooooo good! This recipe sounds and looks amazing. I'm no fan of mushrooms. so I'd def try it without them! Hi Roxy! I think this would still be good without them. Glad it's so easy to change up! Enjoy! I love the versatility of the cauliflower. I use it in everything too. This looks delicious. Yum this sounds so good! Cauliflower and mushrooms are my two favorite vegetables. I think I may try this with my favorite veggie pasta (spaghetti squash). Hi Shannah! I hope you try this one soon! Enjoy! What a delicious satisfying recipe. This creamy pasta is filled with amazing flavors and textures. I'm looking forward to making this recipe tonight! Thanks, Denay! Yes! There are a lot of great components to this one! Enjoy! That looks so gooood!! Seriously, I’ve been eating so much cauliflower lately but not once in a pasta dish! What’s wrong with me?! This is obviously the best way to enjoy cauliflowers! Now I am hungry! This pasta dish looks so delicious! Haa! Thanks so much, Catalina! My family will love this dinner! So easy and delicious! That's good news, for sure, Abeer! Enjoy! I love pasta with veggies. I use mushrooms often, but never thought to add cauliflower. Yum! Hi Allison! I hope you give it a go! Enjoy! this is a unique pasta recipe. I will try it soon. Oh this looks delicious! 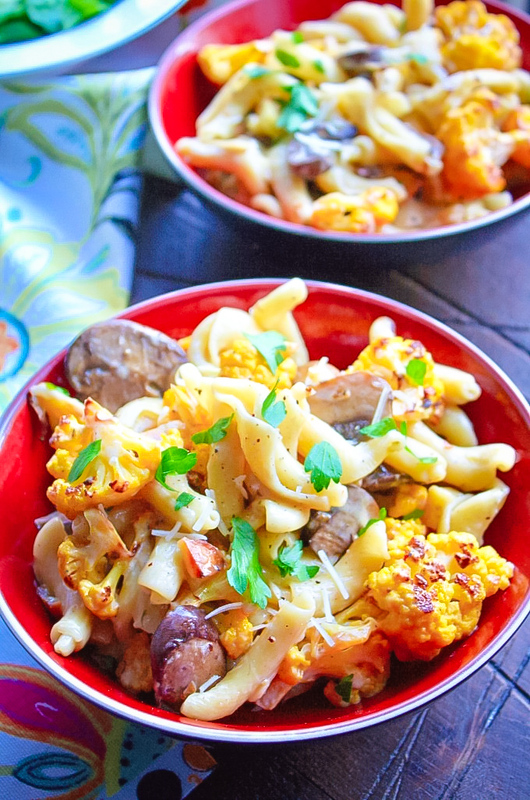 I love making different types of pastas, but I have never thought to add cauliflower! I’m not sure why. Your pictures are wonderful. I come across a lot of recipes when I think, "why have I never added xyz to this?!" One of those things, right? I hope you give this a try and enjoy - thanks, Lawrence! Thanks, Sandra! Hope you give it a try sometime! This pasta looks like it will be the bet dinner! I love this! The best recipe, cauliflower and mushrooms make it less greasy. And roasted veggies are more tasty. Thanks for the recipe. Thanks so much, Lasesana! I'm glad you like this!